MOST people accept that death and taxes are inevitable. But that doesn’t mean you should not try to postpone them. A good accountant can help with the latter, but the usual prescription for the former is a way of life that avoids excess. That advice might be even truer than many of its proponents realise, for it has long been known that restricting the diets of several species of laboratory animal seems to slow down the process of ageing. This is a question not just of avoiding obesity, but of reducing an individual’s intake of calories to a point significantly below normal consumption—almost, but not quite, to the point of malnutrition. At the same time, some drugs are also known to have anti-ageing properties—again, in “lower” animals. It is therefore good news for potential Methuselahs that both these approaches have now been brought closer, phylogenetically speaking, to humanity. 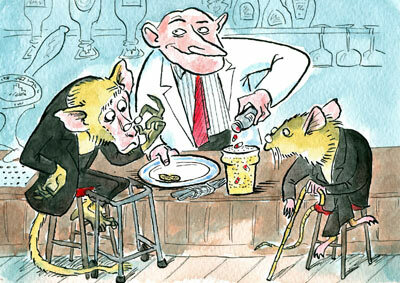 Caloric restriction, as the dietary method is properly known, was tested by Richard Weindruch and his team at the University of Wisconsin using rhesus monkeys— the workhorses (to mix literal and metaphorical livestock) of laboratory studies on non-human primates. Previously, the nearest species to a human for which caloric restriction had been proved to work was a mouse. Dr Weindruch’s results are published in this week’s edition of Science. Meanwhile that publication’s rival, Nature, has a report by David Harrison of the Jackson Laboratory in Maine and his colleagues on the life-prolonging effects of a drug called rapamycin. In this case the experiment was done on mice. But that is much closer to humans than the nematode worms and fruit flies which were the subjects of previous successful experiments on drug-induced life extension. One reason why primates have not been the subject of anti-ageing studies until now is that they live so long anyway. Dr Weindruch’s paper is the result of 20 years of work. Over the course of that period he and his team have looked at 76 monkeys (30 males to start with and, since 1994, another 16 males and 30 females). Half these animals were kept as controls, with no changes in their diet, and the other half experimented upon. Each animal in the experimental group was observed for up to six months to find out how much it ate when food was freely available. It then had the calorific value of this baseline diet cut, in three monthly tranches, until it had been reduced by a total of 30%. The upshot is that, so far, 14 of the 38 control animals have died of age-related illnesses such as type II (late onset) diabetes, cancer and heart disease. Only five of the experimental animals so succumbed. A statistical analysis showed that, at any given time during the study, an animal in the control group was three times as likely to die from an age-related cause as one in the experimental group. Not all of the animals that died did so from age-related conditions. Some succumbed to injury, infection and even complications from anaesthesia. But when it came to these more random deaths, both groups suffered almost equally. Seven went down in the control group, and nine in the experimental one. An apparent win, then, for caloric restriction—though it will not be possible to say for sure until all members of both groups have died and the extra years of life (if any) of the experimental subjects can be known precisely. Semi-starvation is not, however, a course of action most people would be willing to undertake in the hope that it might prolong their lives. But they might be willing to take a pill. Indeed, a company called Sirtris Pharmaceuticals is already running trials of drugs that affect proteins called sirtuins—a group of enzymes which experiments on invertebrates have shown to be involved in extending lifespan. Dr Harrison and his colleagues picked a different molecule that has been seen to work on invertebrates: rapamycin. This substance, isolated originally from a strain of bacterium found on Easter Island—or Rapa Nui as it is known to the locals—acts by suppressing a particular signalling mechanism inside cells, called the TOR pathway. The TOR pathway, in turn, promotes protein production and inhibits the active destruction of parts of cells that are no longer needed. Slowing down all this molecular turnover seems to slow ageing, at least in worms and flies. So Dr Harrison’s team decided to give it a go in mice. Laboratory mice, which have no predators other than the white-coated variety, live for a maximum of just over 1,000 days. The researchers started feeding them with rapamycin at the age of 600 days—about the same point in their lives as a 60-year-old human has reached. The results were impressive. Maximum female lifespan increased from 1,094 days to 1,245, though males did somewhat less well, going from 1,078 days to 1,179. Measured from the time the drugs were first administered in early old age, these figures translate into a 38% increase in life expectancy for females and 28% for males. What is equally interesting is that both the TOR pathway and the one controlled by sirtuins are also affected by caloric restriction. It looks, in other words, as if the drug-based and diet-based approaches are acting in similar ways. That is not to recommend people take doses of rapamycin. Its main medical use is to suppress the immune system, so anyone consuming it casually would open himself to serious infection. But it does hold out the tantalising hope that, at some point in the future, it might be possible to pop a pill and put an extra decade or two on your life.